We’re so excited to finally let you in on a juicy secret of ours! Today marks the official debut of San Franpsycho® IPA, a Juicy IPA created with long-time collaborators San Franpsycho®, a community-based clothing and lifestyle brand. A delicious, balanced and easy-drinking beer that finishes with floral hops and big, juicy notes of peaches and apricots, San Franpsycho IPA is the perfect, sessionable summertime brew. This IPA celebrates the city and culture of San Francisco but will be available nationwide—bringing the unique ethos of the City by the Bay to beer lovers from coast to coast. Brewed with 2-row pale, red wheat and acidulated malt, San Franpsycho IPA pours a hazy golden straw color with a white fluffy head. The mouthfeel is creamy and smooth yet mildly effervescent with a hint of back-end tartness. San Franpsycho IPA is fermented with a mixed culture of yeast to create a unique and fruity estery nose, unlike any other IPA from Anchor. Anchor brewers add peach and apricot fruit puree during the secondary fermentation, giving the beer a pleasant hint of sweetness and abundantly fruity aromas of peach, apricot, and pineapple with a bit of funky dank. The slightly sweet taste, with a mild Belgian complexity from the yeast and a finish of fruity hops, makes San Franpsycho IPA the perfect pairing for ceviche, avocado toast and peach cobbler. 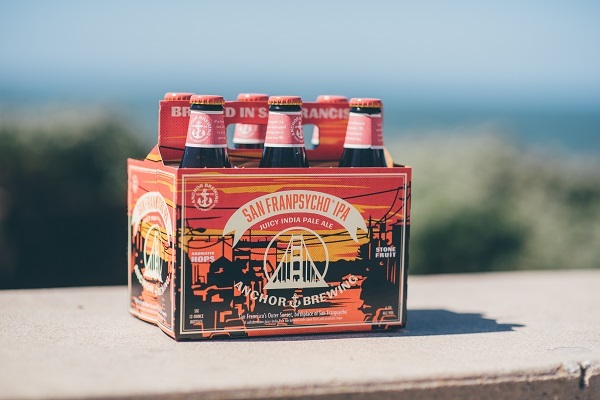 The name San Franpsycho IPA speaks to San Francisco, but specifically to Ocean Beach and the Outer Sunset neighborhood. The label design is a classic view from the Noriega hilltop looking down to the Outer Sunset and Ocean Beach. Anchor and San Franpsycho will host an official San Franpsycho IPA Release Party on Friday, April 13th at Neck of the Woods in San Francisco. The San Franpsycho crew and Anchor brewers will be onsite, and attendees can enjoy San Franpsycho IPA on draft. San Franpsycho will be live screen printing a limited-edition design to celebrate the release, and the event will feature a local music showcase. Click here to see more upcoming Anchor and San Franpsycho events too! San Franpsycho IPA is available from April through September in 12oz. bottles and on draught at select bars, restaurants, and stores as well as at Anchor Public Taps and the Anchor Brewing Taproom in San Francisco. You can find a brew near you by using the Anchor Beer Finder. Just tried this beer, read your description of it, and I love San Fran even more! Great job and hope to visit soon (for the first time since I proposed to my wife in 2000).